St. Kitts is one of the most spectacular islands in the Caribbean. If you’re looking to stay on this island that’s a part of a two-island nation, which also includes the island of Nevis, you’re sure to enjoy a trip of a lifetime. With jaw-dropping scenery, including everything from picture-perfect beaches to lush rainforest, whether you want to spend your time on the water, on land, or a little of both, you’ll find a wealth of things to do, including these. Where: Wingfield-Phillips Rainforest just outside the capital city of Basseterre. What: More than a quarter of the island is designated national park, which is mostly made up of rainforest, and there are miles and miles of trails winding through the scenic landscape that offer the opportunity for fabulous walks and wildlife watching. 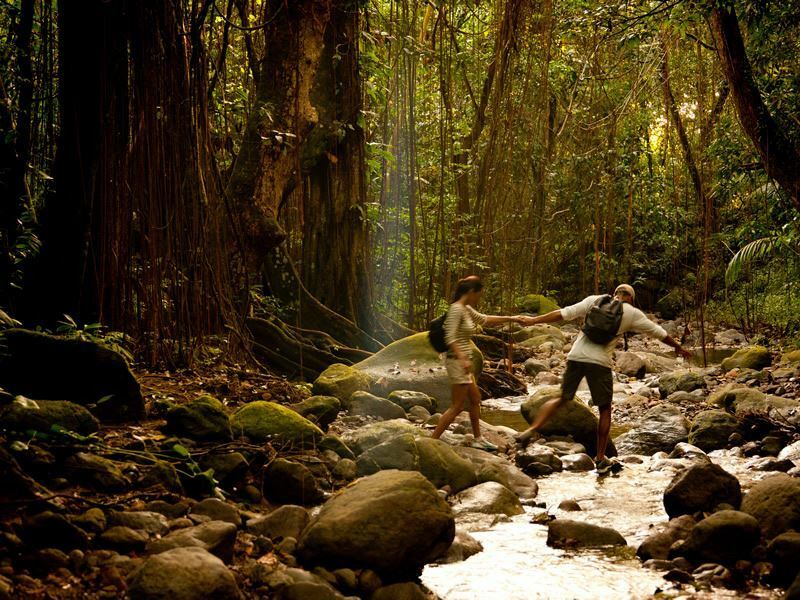 While it is possible to hike shorter trails on your own at some plantations, such as Ottley, in general it’s best to hire a guide, not only for safety’s sake, but you’ll have a wealth of knowledge about the local history and nature right at your fingertips. Highlights: Some of the animals you might see include playful vervet monkeys, mongoose and lizards, as well as a host of colourful birds. Guides can help point out the many well-hidden birds and fascinating plant life. Where: On the Caribbean side of the island. What: Brimstone Hill Fortress is a UNESCO World Heritage Site that’s considered to be one of the best preserved forts in both North and South America. Highlights: This “Gibraltar of the West Indies,” as it’s sometimes referred to, truly feels like a step back in time. 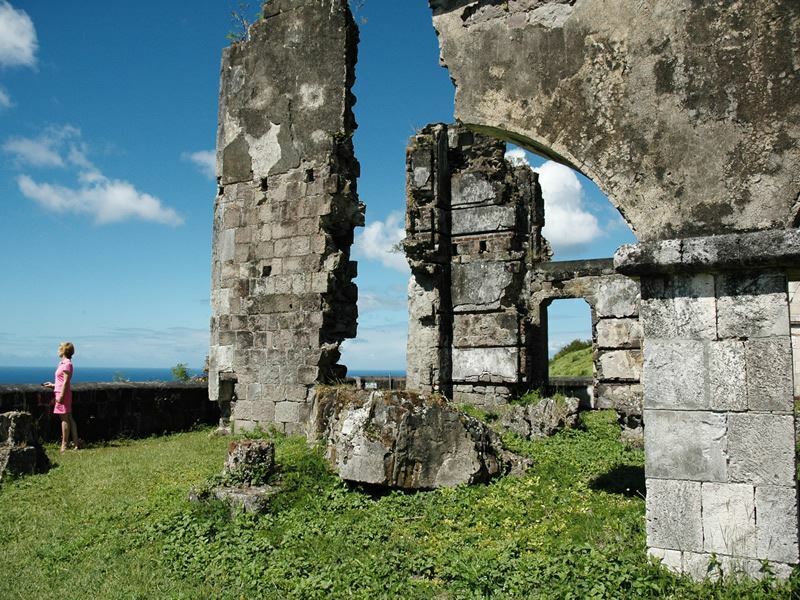 Not only can you walk in the footsteps of the African slaves who built and maintained it, viewing evidence of the former 18th century military community, but this is one of the best spots for viewing the vast expanse of the Caribbean and its incredibly brilliant blue shades. After a tour to learn about the citadel’s history, it’s practically a must to take a selfie next to one of the old cannons on the ramparts. When you climb up to the top slopes on one of the frequent, clear sunny days, you’ll get that fantastic Caribbean vista as your backdrop and as many as six other islands in the distance too. 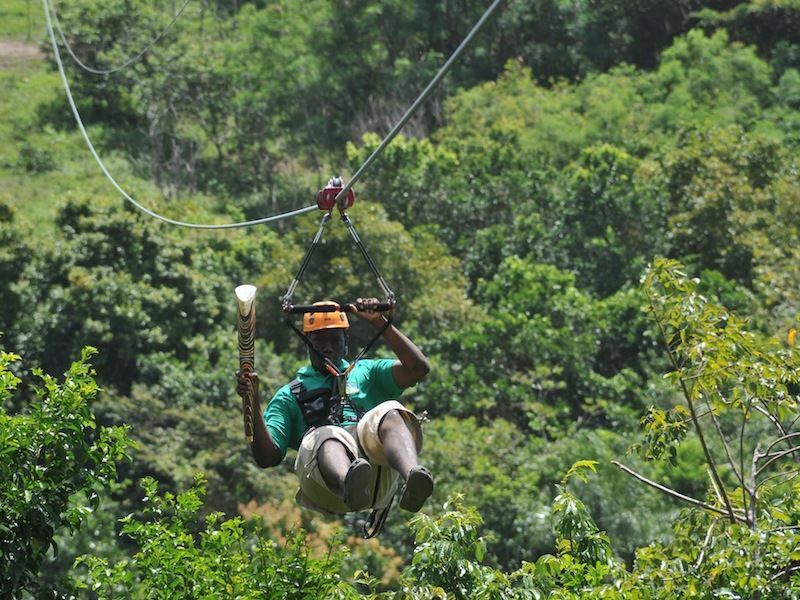 Where: Via Sky Safari Tours in Old Road Town on the western side of the island. What: Sky Safari Tours offers zip-line adventures that provide a thrilling and unique perspective of the island, allowing rides to soar one of five zip-lines running up to 1,350 feet in length. Highlights: Riders get a bird’s-eye view of the lush rainforest, neighbouring islands and historical sites while whizzing above the canopy of trees. The even more adventurous can enjoy one of the most adrenaline-fueled experiences on the island by soaring across a dual line, competing with other zip-liners to see who can get to the other end of the line first. No matter which line you choose, you’ll be guaranteed breathtaking panoramic views, due to the strategic positioning of each. Where: Royal St. Kitts Golf Club on the grounds of St. Kitts Marriott Resort near Basseterre on the western side of the island. 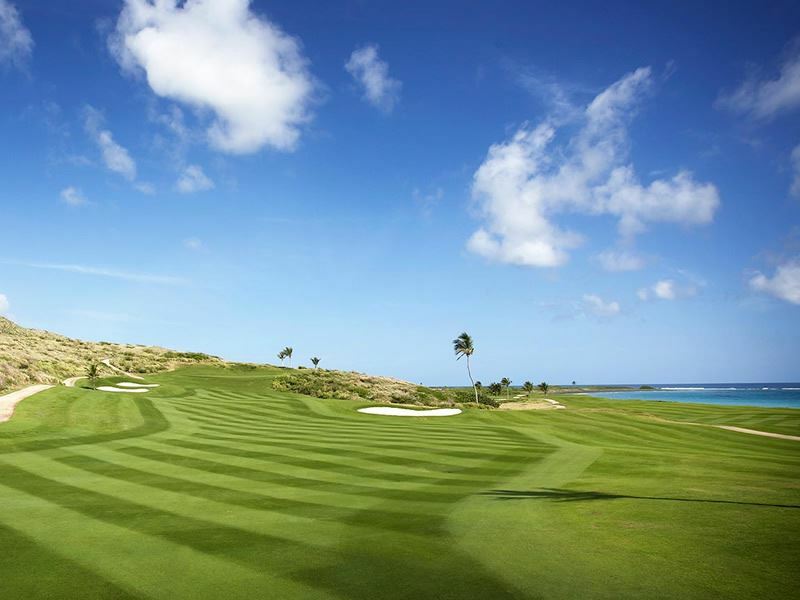 What: St. Kitts is home to the 18-hole championship par-71 Royal St. Kitts Course with its palm-fringed fairways strung along the Atlantic coast considered to be one of the most scenic courses in the Caribbean. Highlights: Royal St. Kitts culminates in an unforgettable sequence between the 15th and 17th holes. From the signature 15th hole, sitting atop the highest point on the golf course, you can not only see the ocean, but the neighbouring islands of Nevis, St. Maarten and Saba. 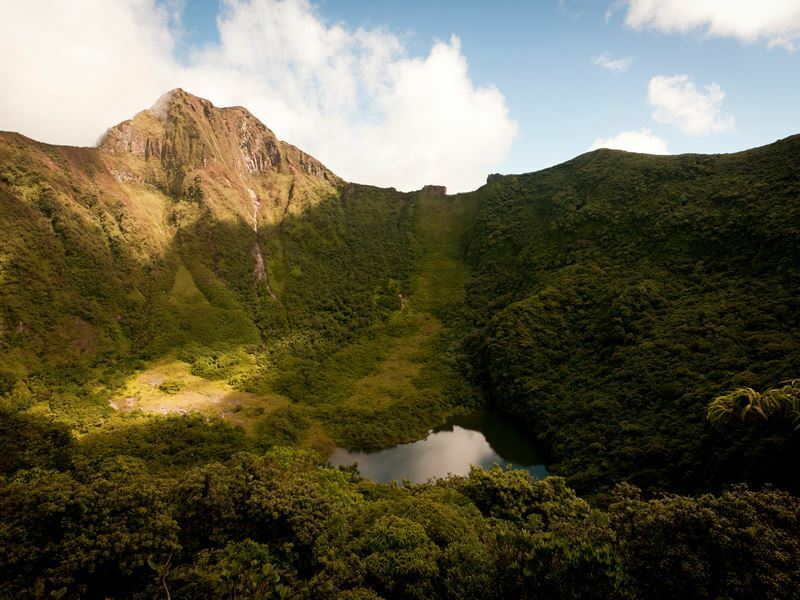 Where: Mount Liamuiga, in the northern region of the island about 14 miles from the capital city of Basseterre. What: Most don’t equate mountain climbing with an island vacation, but as St. Kitts is dominated by three volcanic peaks, including the nearly 3,800-foot-high Mount Liamuiga, the more adventurous can take a steep hike to its crater. Access to the rim as well as the inside of the crater can be rather treacherous so don’t try this without a guide, you’ll find many experts to choose from. Highlights: If you’re up for this challenge for the physically fit, requiring a two-and-a-half to three-hour trek to get to the rim, you’ll not only be rewarded with the sight of the impressive deep crater along with fabulous views of the neighbouring islands, but you might even see wild orchids and monkeys along the way. Those who are looking for even bigger thrills can descend straight down into the crater. From within the crater, the feeling of being inside of a volcano, as if you’re completely enveloped by the mountain range while the occasional smell of sulphur wafts through the air to remind you where you are, is truly unforgettable. 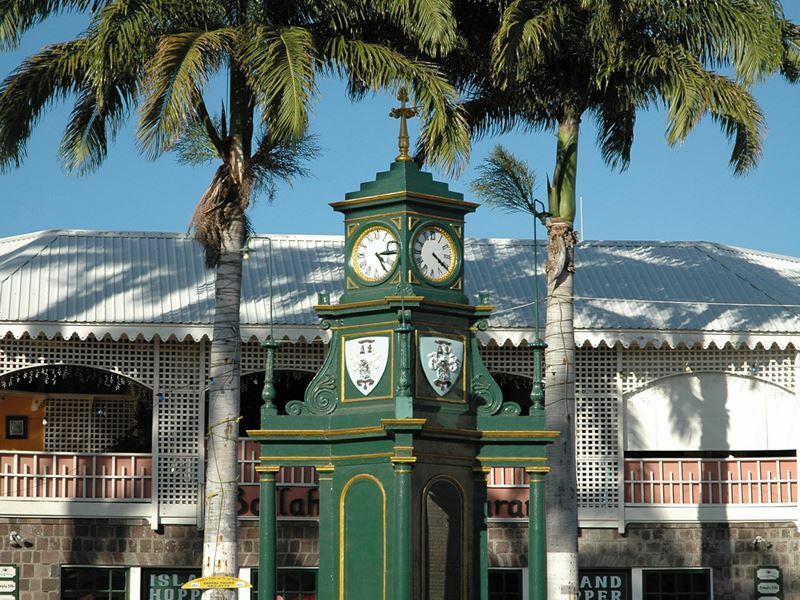 Where: The quaint capital city of St. Kitts lies along the southwestern coast of the island. What: Basseterre is a relatively small city, home to some 13,000 inhabitants, but it’s big on charm with its friendly locals and thriving art scene. Highlights: Head to “The Circus” - a focal point for both locals and travellers, it offers the opportunity to mingle and get to know a more authentic side of the island. Surrounding the main square, it features a water fountain and clock tower, but it’s not the clock tower that makes it so memorable, though it is a highlight, with its alternative times shown on each of the four faces. What is truly unforgettable is the colourful nature of the locals and the vendors, selling everything from unique gifts to fresh fruits. Pop into the Gallery Café to check out the local art scene, filled with vibrant works from island artists that make for the ideal souvenir to bring back home. If you like people watching, take in the entire scene while sipping refreshing beverage on one of the restaurant balconies. Where: Bordering South Frigate Bay Beach, a sandy stretch along Frigate Bay found southeast of Basseterre at the northern end of the isthmus. What: A smattering of nightlife hotspots and watering holes popular for partying and enjoying a good time until the wee hours of the morning. Highlights: The Strip is renowned for its happening nightlife, with the opportunity to dance to live music or DJs as well as to enjoy fantastic fresh local cuisine. 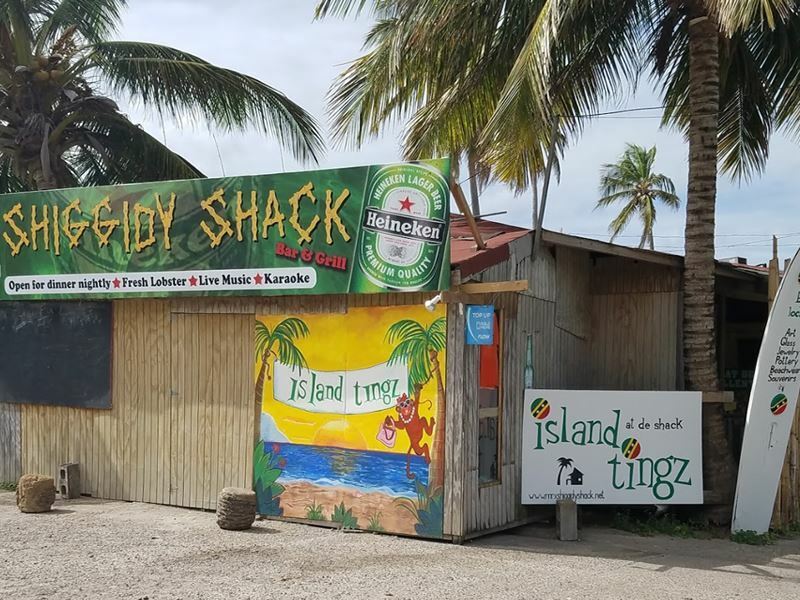 It hosts the world famous Mr. X’s Shiggidy Shack, long known as one of the very best beach bars in the entire Caribbean. This beach bar features special events like fire-eating shows, roaring bonfires, live bands, DJ tunes and karaoke, as well as delicious Kittitian fare served in a traditional island setting. Monkey Bar, with its open-air dance floor, is considered the prime spot for dancing and also includes an outstanding restaurant. 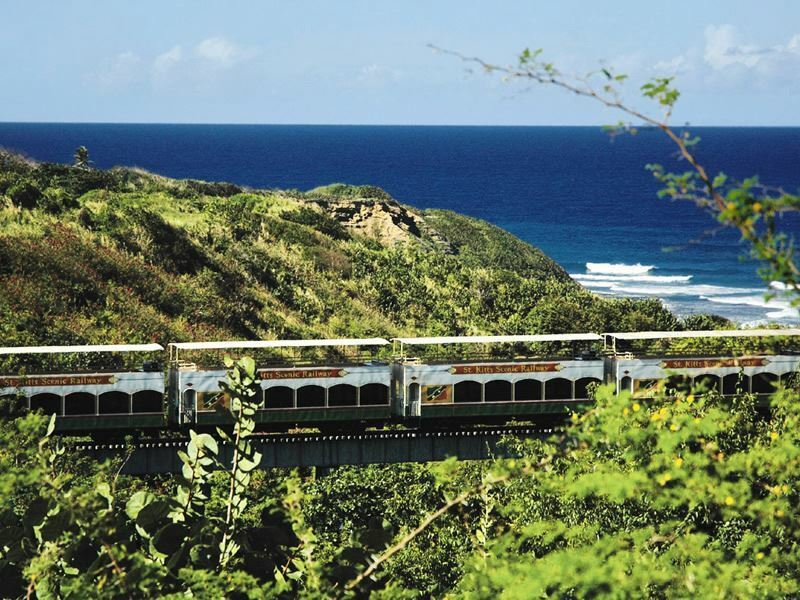 Where: The St. Kitts Scenic Railway traverses an 18-mile-long narrow gauge railway line along the island’s coast, leaving from Basseterre. 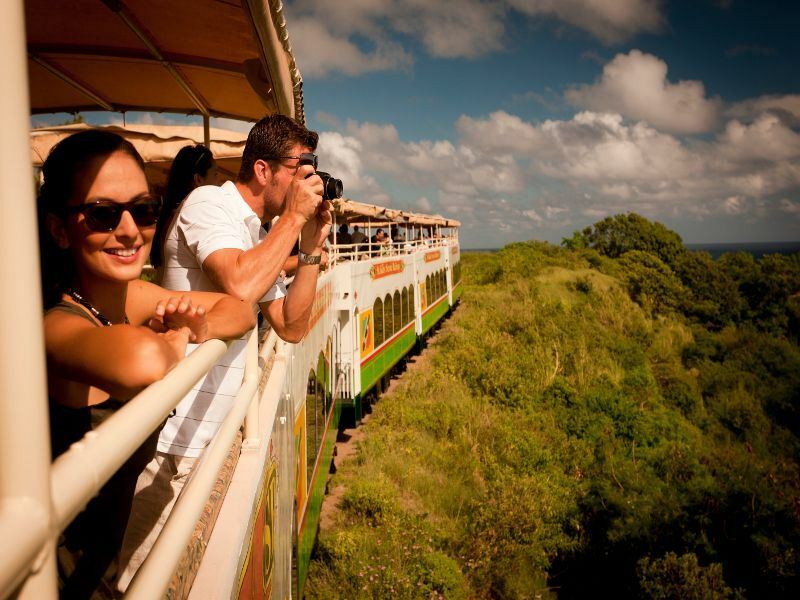 What: Sometimes referred to as The Sugar Train, the St. Kitts Scenic Railway is the last one of its kind left in the entire West Indies. Made for the sugar trade nearly a century ago, it takes sightseers on a three-hour tour around the coastline, providing the ideal opportunity to get familiar with the island, its scenery and culture. Highlights: As the carriages feature open-sided top decks, passengers can enjoy the warm breeze, the scenery and the calypso sounds of the train’s own choir, all while sipping complimentary rum punch. Look forward to breathtaking ocean views, dramatic cliffs and lush vegetation, as well as deep canyons, picturesque villages and rippling fields of sugar cane, while the volcanic cone of Mt. Liamuiga that rises above it all provides a dramatic backdrop. The conductor will point out all of the sights, including other highlights like Brimstone Hill Fortress, St. Paul’s Village, old sugar estates with windmill and chimney ruins, and more. Where: Throughout the island of St. Kitts. 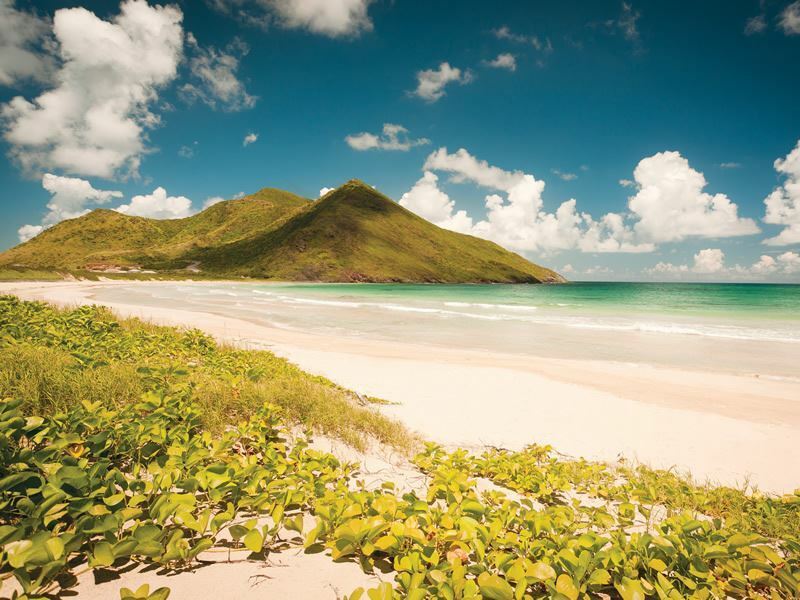 What: St. Kitts offers everything from classic Caribbean beaches to dark stretches of volcanic sands. There are popular activity-filled beaches with all sorts of facilities to quieter stretches of sand ideal for romance, and just about everything else in between. Highlights: Cockleshell Bay, which faces Nevis from the island’s southern tip, provides beautiful views of its neighbouring island along with striking, powdery white sands that offer a stunning contrast against the gentle jewel-hued waves of the sea. There are also a wide variety of eateries and beach bars scattered across the over two-mile-long beach. As it’s a popular spot with both locals and visitors, if you’re hoping for fewer crowds, arrive early on a weekday. Majors Bay is generally the place to go if you’re looking for a more tranquil, isolated beach to relax on without bumping elbows with others. It’s idyllic for romance, with its frequently empty stretches of sand and wonderfully clear, calm waters. While there aren’t any facilities, there aren’t any cruise crowds to contend with either. When you want to take a dip, you can jump into a gorgeous natural pool that was created by an old shipwreck, which also happens to make for some fun underwater exploring too. North Frigate Bay Beach is considered another one of the islands very best. Located on the Caribbean side, this gem offers pristine, long stretches of soft sands, and even during the peak season it tends to remain relatively quiet. It’s also an excellent swimming spot with its long reef that keeps the waters calm. While you’re here, you can spend time on a black sand beach too – Conaree Beach is a narrow strip of black sands that signify the melding of the coral and volcanic features of the island. As it faces the Atlantic, it’s ideal for bodysurfing and offers some good snorkelling along the reef as well. Where: The crystal clear waters that surround St. Kitts make the entire island a water sports enthusiasts’ paradise. What: Enjoy everything from sailing out on a catamaran, jet skiing and surfing to the most popular active pursuit: snorkelling and diving. Highlights: The tropical fish, stingrays, sea turtles and vibrant coral, found in the incredibly clear waters that surround the island make both diving and snorkelling especially popular in St. Kitts. Most dive sites can be reached within a mile off shore (via a number of tour operators), where outstanding visibility and plenty of diversity awaits, including wrecks and shallow reefs. Snorkelling is possible right from some beaches too - the very best can be found at White House Bay. While it has a pebble beach, the bay has calm, sheltered waters, and the rocks ensure that there are lots of coral and fish to see. Other spots popular for snorkelling including Dieppe Bay and Turtle Beach, as well as North and South Frigate Bay. Time to plan your next trip already? With so much to see and do on this Caribbean treasure, odds are, you’ll find yourself planning a return trip before you’ve even embarked on the flight home!